Image: Andre Jurgen Traffic officers are on site to ensure motorists are safe on the snowy roads. 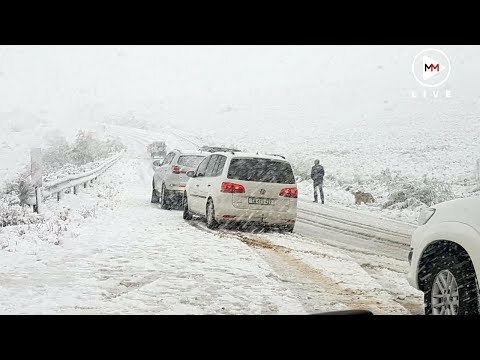 The South African Weather Service has warned of expected disruptive snowfalls in places over the high ground and mountainous areas of southern Namakwa of the Northern Cape‚ as well as the West Coast District and Cape Winelands of the Western Cape on Monday. An intense cold front is moving over the Western Cape and southern Northern Cape‚ spreading into the Eastern Cape. The forecast is for cloudy‚ windy and cold to very cold conditions with isolated showers and rain in places‚ but partly cloudy in the extreme east. “The public and small stock farmers are advised that very cold conditions with snowfalls as well as wet and windy conditions are expected which will spread to areas over southern Free State and north-western KwaZulu-Natal tomorrow‚” said Madimetsa Thema‚ SA Weather forecaster. A blanket of white is already covering the area around the Matroosburg reserve near Ceres‚ after overnight snowfall created a winter wonderland. Snowfalls are also expected over the high-ground areas of the Eastern Cape‚ including the mountains between Willowmore and Joubertina‚ the Sneeuberg‚ Winterberg and Southern Drakensberg.